The assistant principal of Orange River Elementary School called in the cops after a teacher spotted the smooch Wednesday at the Fort Myers school. In fact, Margaret Ann Haring, 56, initially called child welfare officials, who directed her to contact the sheriff, according to a report. 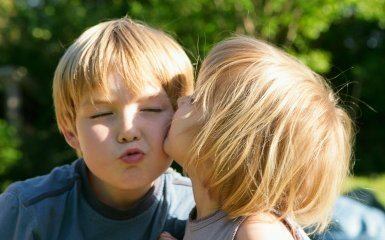 The kiss apparently occurred after two girls debated over whom the boy liked more. That's when one of the girls "went over and kissed" the boy. The redacted sheriff's report notes that Haring "stated there were no new allegations of sexual abuse as far as she knew." If only schools had a zero tolerance policy when it came to stupidity.